WE ARE THE FIRST public university in northern Ohio to create a varsity esports program, placing our Division I Mid-American Conference (MAC) university among a small but growing number of institutions nationwide adding the unique sport. The new program will be housed in a state-of-the-art esports arena that will be furnished with customized gaming computers, and scholarships will be established for students selected for the varsity program. Michael Fay Jr. has been selected for the position of esports director and head coach, pending final approval by our Board of Trustees. Fay’s extensive experience in the esports market includes being a production director for esports competitions for Softlocke, which specializes in producing content and entertainment for the industry. He is also experienced in providing commentary for esports tournaments and creating competitive video gaming content for online platforms like YouTube. Fay earned a master’s degree in emergent media at Champlain College and holds a bachelor’s degree in psychology from Saint Michael’s College. The varsity program — involving 30 to 35 students — will be housed in the Drs. Gary B. and Pamela S. Williams Honors College. An associated club esports program will involve several hundred students. Learn more about Zips Gaming and express your interest in joining! During his ongoing visits to area high schools, Wilson has talked with students, principals and others about esports coming to UA. There has been great interest in the program, especially from teenagers and gamers already familiar with the sport. UA’s varsity esports teams will train and compete with other colleges in some of the nation’s most popular strategy and battle video games like League of Legends (a multi-player online battle arena), Rocket League (a vehicular action sports game), Hearthstone (an online trading card game) and many others. The structure of the program will mirror traditional varsity athletics with team members participating in tryouts, wearing uniforms and maintaining practice schedules. Junior Matt Speidel, an avid gamer, hopes that his participation in Zips Gaming will lead to a career on the business side of esports. A student does not need to become a player on the varsity or club teams to benefit once UA’s esports program gets up-and-running. 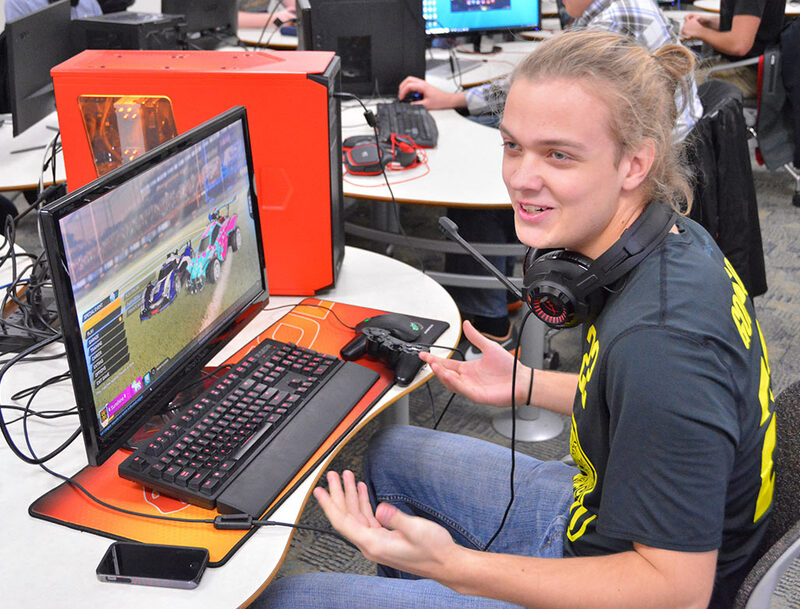 Engineering and computer science students have volunteered to build the machines for the esports arena on campus; communications students can broadcast games and provide commentary, while also serving as videography and audio experts; graphic designers can create uniforms and logos; and students in various health professions majors can work with the teams as personal trainers, sports psychologists and nutritionists. Esports is organized team-based, multiplayer online video gaming that is growing in popularity with professional and amateur participants, along with viewers. Some top professional esports teams have earned up to $10 million annually through prize money and sponsorships. A recent championship tournament attracted nearly as many viewers as the Super Bowl through viewing online, and at movie theaters and other venues. Video game competitions are regularly streamed on the internet and broadcast on television, including the Big Ten Network. Lisa Craig, 330-972-7429 or lmc91@uakron.edu.